First off: I SO wanted this movie to be, well ... fantastic. I've been missing my Harry Potter fix for a while now, and the events of Fantastic Beasts take place 70 years before Harry Potter's time at Hogwarts. Unfortunately, the film is very, very slow, which deters me from giving it a high rating. 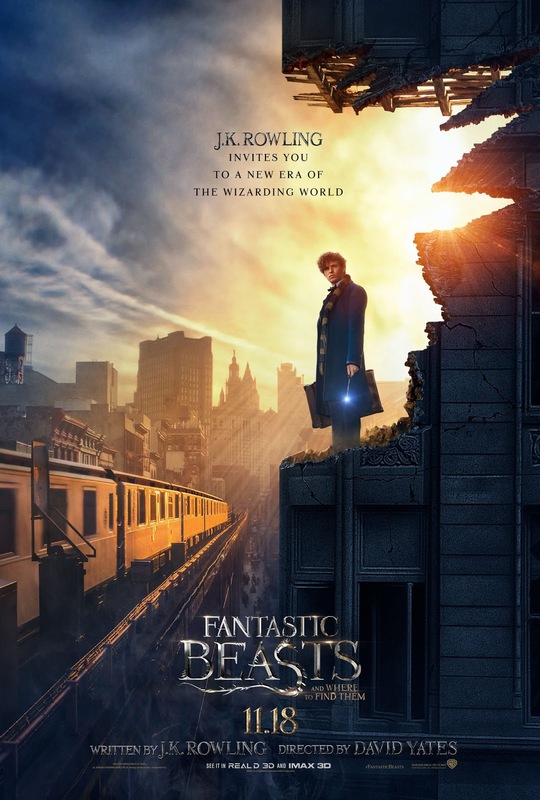 Newt Scamander (Eddie Redmayne) travels from England to New York via boat, to accomplish some things, and he brings along some special creatures with him, in his suitcase. Due to a mix-up when he arrives, however, a "non-maj" (non-magical person, aka Muggle), Jacob Kowalski (Dan Fogler), ends up with the suitcase, and Scamander must retrieve it from him. Once he does, the two of them end up meeting Ms. Goldstein (Katherine Waterston) and her sister, Queenie (Alison Sudol), who will eventually end up helping them with Scamander's mission. For those unfamiliar with the Harry Potter universe, Fantastic Beasts and Where to Find Them is actually a textbook that he and his friends use while at Hogwarts, and Scamander is the author of said textbook. J.K. Rowling released the book in actual book form a few years ago, too, and she wrote the script here, as well; however, the movie is technically unchartered territory, since the book is more of a guidebook than a novel. Yes, see this movie, but it gets my lowest Yes review (3 stars). I will say that the special effects would be 4 or 5 stars, out of 5, but unfortunately we don't get much wizarding action in that regard until the end of the movie. I saw the film in 2D, as well, but I'm betting it would be great in 3D. The cast here, especially Redmayne (one of my favorites) is very good; Jon Voight plays a small role, as well, and Colin Farrell as Mr. Graves, someone who could possibly be an enemy. Ezra Miller (The Perks of Being a Wallflower) is very good here as well, as an adopted boy whose life has been made hell by his adoptive mother. There's an A-list celebrity cameo near the end, too, but I won't spoil that here. Fantastic Beasts was originally planned as a trilogy, but now it will be a set of five movies, spanning 19 years of history. Will I see the next few? Yes. But I'm hoping they are a little more enchanting than this one was - the story here was good, as was the acting, but for me, it was missing some of the spark that the previous Harry Potter movies had. Fantastic Beasts and Where to Find Them is in theaters today, November 18th, and is rated PG-13 with a runtime of 133 minutes. 3 stars out of 5.